The Ajanta represents the highest development of the art of fresco-painting in India. The antiquity of these caves and paintings go back to a period between 2nd century BC and 8th century AD. Apart from showing scenes from the Jataka tales--accounts of Buddha's earlier incarnations—we find princes and princesses bedecked with jewellery, hermits, transactions at the market, celestial musicians, war-horses in colourful trappings, animals and birds. The image of the meditative Buddha appears vibrant with life, in different moods when approached from different angles. 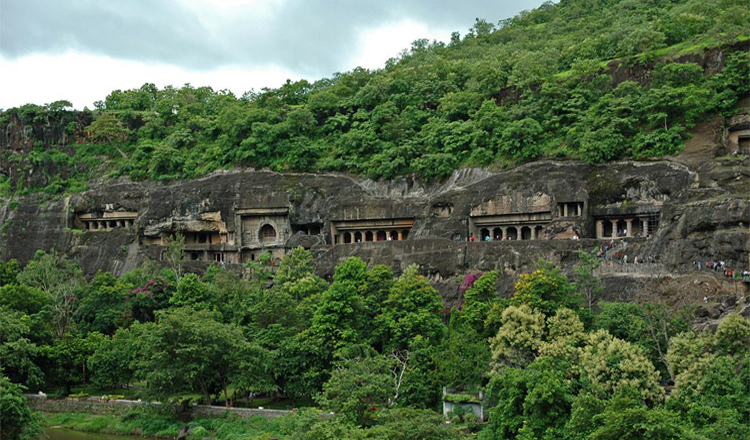 There are thirty rock-hewn caves at Ajanta, cut into the scarp of a cliff. They were used either as Chaityas or as Viharas. The splendours of Ajanta are still in the process of being unravelled. Some new paintings came to light only recently. Ajanta is the largest, UNESCO-recognized, historical monument worldwide. It is located just 55 km from the city of Jalgaon and 105 km from Aurangabad (city in the state of Maharashtra). Ajanta has 30 caves, five of which are called "Chaitya-Grihas", and the remaining monasteries are five (9, 10, 19, 26 and 29). These caves, built in the early 2nd century BC, were discovered in 1819. Ajanta offers a unique combination of architecture, sculptures and paintings. The paintings have a strong religious background and show Buddha, Bodhisattvas, events from the life of Buddha or the Jatakas. It took 30 years to build a cave. These cave temples or chaityas are up to 30 meters wide, 15 meters deep and four meters high. The Buddhist caves of Ajanta owe their name to the nearby village of Ajanta, about 12 kms away. They were discovered by chance in 1819, while the British officer, John Smith, went hunting. It did not take long and the caves became famous and ultimately became a popular tourist destination. The entirety of the caves extends over the front of a horseshoe-shaped rocky gorge. This very quiet location was ideal for the Buddhist monks who lived here until the 5th century AD, and especially during the rainy season. The origin of the caves did not follow the order of their numbering. There are, according to the style to judge, some older in the middle and the newer ones at the each end. The older caves belong to the Hinayana sect of Buddhism, including five caves. The oldest cave (number 10) dates back to the second century BC and is also the largest cave. The cave 1 was the last one to be excavated and is considered particularly beautifully decorated and worth seeing. The caves are also known for their magnificent murals, which are characterized by a fascinating detail & depth. Today the paintings are protected by Plexiglas, as they were previously damaged by visitors. One can discover a variety of different types of painting: from the above-mentioned excerpts from the life of Buddha, the depiction of animals (eg, deer), Jataka tales, to the painting of the "dying princess" (which fainted when she learned that her husband would forgo all his possessions, and henceforth become a monk). All colors are made of minerals except blue. These are so-called temperabilders. To impart proper adhesion to the mineral colors to the dry ground, the painters of that time mixed vegetable gum. The paintings are still very well preserved. Also the ceilings are decorated by geometric and floral patterns. There are also numerous statues, sculptures, a shrine and a stupa. How to get to Ajanta? By plane: In Aurangabad is the closest airport. International flights depart from and to Delhi or Mumbai (Bombay) every day. Indian Airlines and Jet Airways offer daily flights to Aurangabad. By train: Jalgaon is the nearest station, which is about 58 km from the caves. By car: The road to the caves is ideal. They are directly linked to the roads to Mumbai, Jalgaon and Aurangabad. Between Aurangabad and the caves are regular buses and taxis.